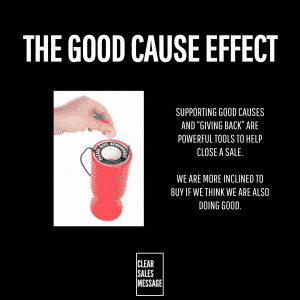 The Good Cause Effect is where you ensure that the sale of your products and services does some good in the world. It works because as consumers we are all becoming socially more conscious about the world and our impact upon it. If we know that buying X product gives something back, and buying the next competitor doesn’t, it can be a deciding factor to making the sale. The most famous example of this is TOMS shoes. For every pair of shoes they sell, they provide a pair of shoes to someone in need. Your offering could match a purchase in this way, could donate money to charity or could provide something else such as meals in Africa. The relevance of the good cause offering itself isn’t that important, it’s the fact that you do some good in the world that will help be a “closing factor” to a potential client.